ask how the Tortoise can move around if he is so slow. They race and Tortoise is going to prove slow and steady can win the race. The main character, Tortoise is slow but patient. Tortoise for example, he tries to win the race by going slow and steady. 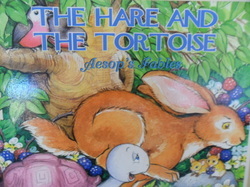 The other character the Hare is over-confident because she challenges the Tortoise in the hot day. The Hare is fast and agile because she zooms in the race until she gets tired. race until she gets tired.